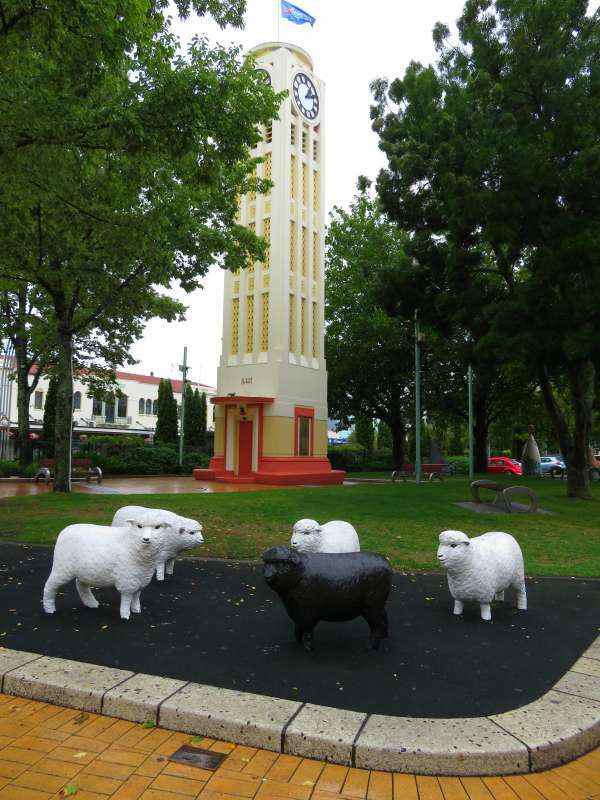 The Travelling Lindfields: From Disaster to Art Deco in Napier, New Zealand: How an earthquake shaped the city. David and I spent a week this year in a holiday cottage not far from Napier. We came to explore the Hawke's Bay cycle paths. 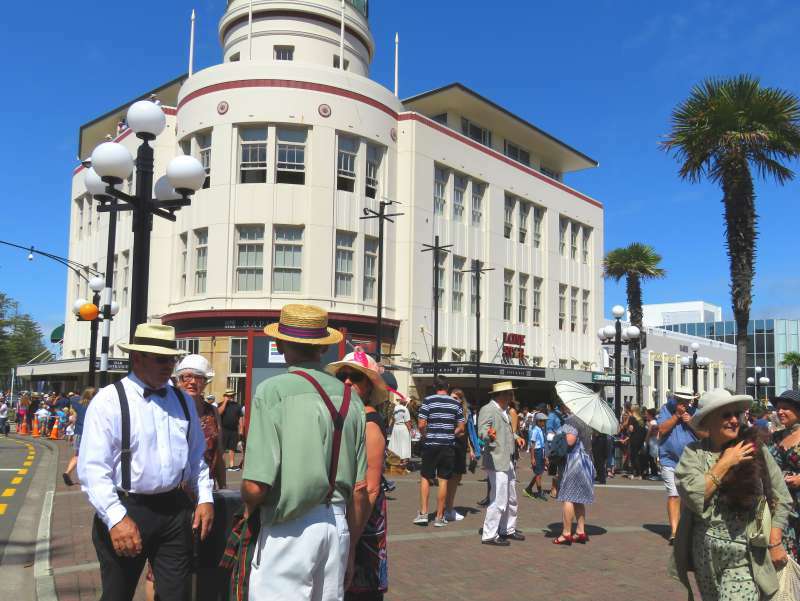 Purely by chance our visit coincided with Napier's annual Art Deco Festival where the whole population dresses up and celebrates 1930's style. There are vintage car parades, fashion shows, street theatre, outdoor concerts and a Great Gatsby picnic. Next week, or maybe the week after, I will tell you about the cycling, but this week I'm going to let my camera do the talking and give you a glimpse of Art Deco in Napier. Napier has more than its fair share of vintage cars even outside the week of the festival. It wasn't only the women who got into the spirit of dressing up. Men sporting boaters, braces and checks were everywhere. The next three photos are all from Hastings, a short drive from Napier. Hastings was destroyed by the same earthquake and also rebuilt predominantly in Art Deco style. 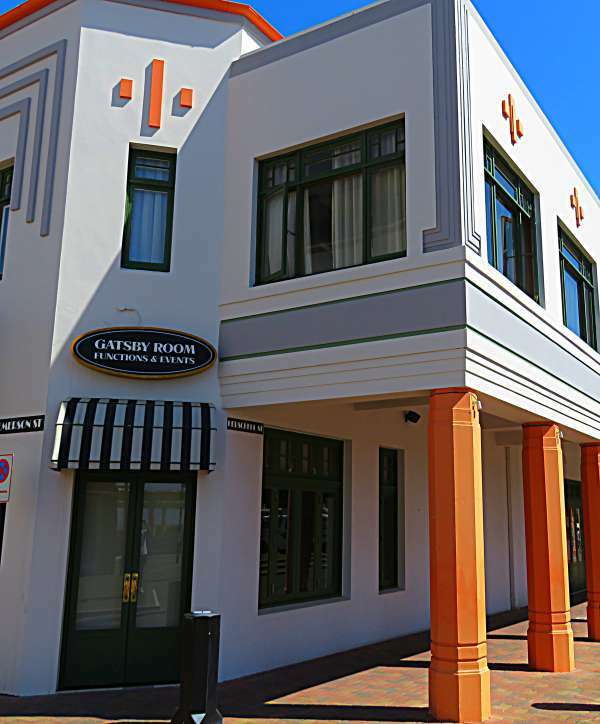 There are more Art Deco buildings in Hastings than its famous neighbour, but Napier's Art Deco is concentrated in a small central area while the style is much more spread out in Hastings. Don't you just love the fake sheep in the second photo. 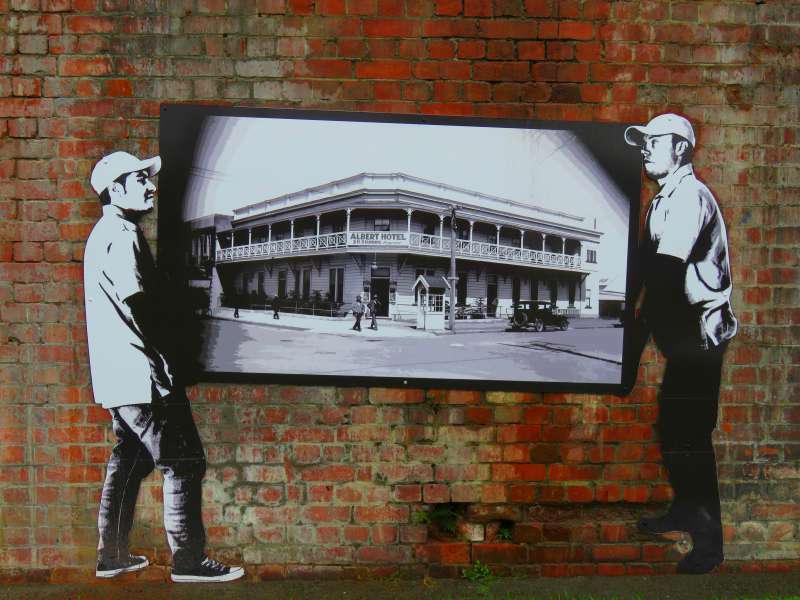 The third photo is a mural not far from the centre of Hastings. It makes me think of the rebuilding of the city - as if the structures were carried away and then just popped back into place once the danger had passed. The Art Deco Festival is on each year. Catch it in 2018 between 14 and 18 February. Don't worry if you aren't in Napier for the festival. While seeing the locals dressed up as though it is the 1930s is fun, the buildings are there all year round. There is also an Art Deco Celebration each winter. This year it is on from 14 to 16 July. You don't need a special tour to see the Art Deco, just walk around - you can't miss it. Hawke's Bay has some great leisure cycling trails. Hire a bicycle while you are there and cycle along the shorefront. Fantastic! I love Napier - my sister lives in Havelock and have visited the Napier region many times over the years. I love the art deco buildings - such a great example of a city being able to rebuild after a natural disaster but retain incredible character. I'm yet to visit during the festival, but hopefully one year - it sounds so much fun! Wow - it is a small world. We actually stayed at Havelock North, not in Napier itself. The festival was great fun but unfortunately the first couple of days saw heavy rain. When the sun came out though the whole town seemed to be involved. Napier is a jewel. I love the downtown buildings. I took a guided tour and learned a lot about the various buildings. The tour also talked about how the land rose (about 2m) and changed the shoreline. Thanks for your photos of Hastings. I have never been there before. I would have liked to do a tour but it was so busy during the festival we decided it was easier just to wander around ourselves. We learned a lot about Napier's history though from signs around the town. And the cycling was stunning! Art Deco is gorgeous when it is looked after. I love the Art Deco - but also the clothing and cars for the festival. Awesome photos! We went to Napier a couple of years ago outside the week of the festival and we still saw vintage cars, but if you want the dressing up bit you need to be there during the festival. I'm with you, I love seeing people all dressed up in period clothing. I had no idea. I would love to see the festival, I'm going to have to start saving up my pennies. Getting to New Zealand is easy for us because we live in Sydney, but it is quite pricey once you arrive. There were shops in town where you could buy beautiful vintage dresses and accessories. I was very tempted by them. 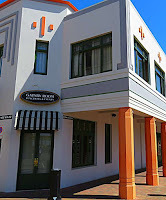 We love art deco and totally enjoyed our visit to Napier several years back. The Art Deco festival wasn't on when we where there, but still got to see some locals dressed in style. 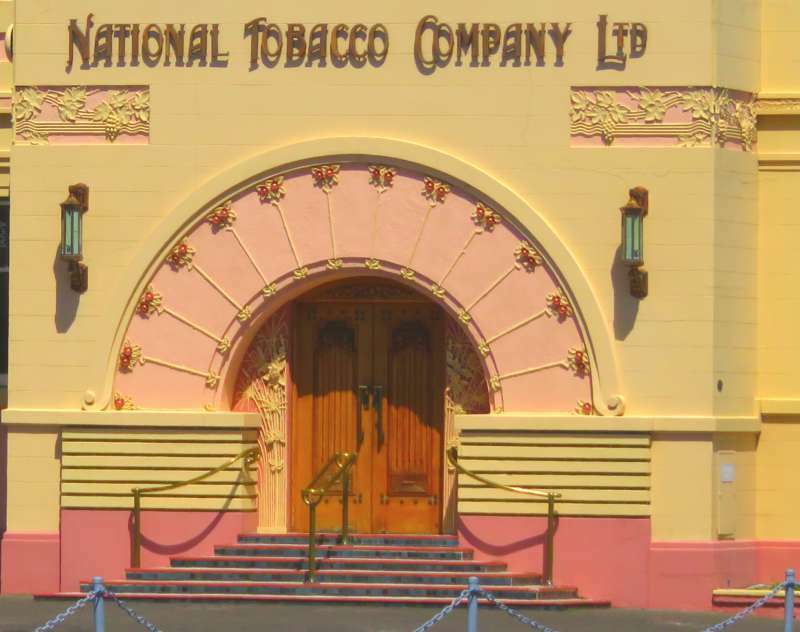 We went inside the National Tobacco company building, it was lovely and in keeping with the whole town was like stepping back in time. I didn't know you could go inside the National Tobacco Building. I took my photo while we were out cycling. It is a stunning building. New Zealand is in one of those terrible earthquake zones. The quake in Napier was the worst they have experienced but a few years ago there was a devastating quake in the South Island which all but flattened Christchurch. I was in Japan for a year and experienced some minor earthquakes, and they already scared me. 2 and a half minutes sounds horrendously long. The Art Deco buildings and festival seem like a lot of fun though! It would be interesting to experience a bit of the 1930s today! The whole 1930's thing was a lot of fun. I love festivals where people dress up and pretend they live in another time. Art deco is one of my favorite architectural styles. Napier is gorgeous! Thanks for linking in this week at #wkendtravelinspiration! I was never a great fan of Art Deco. You see a few residential examples around the streets of Sydney and they always look out of place and just a little bit shabby, but when it is done well like it is in Napier, it is gorgeous. Love Art Deco! Will definitely have to time a trip to NZ around festival time. And have to get one of those snazzy Boater hats! :) Fun times - thanks for sharing. Haha - I have to laugh at your description of boaters as 'snazzy'. Both my sons had to wear them to and from school everyday and they hated them with a passion. They used to say that it was like wearing a plank of wood on their heads. Maybe the ones you buy in Napier are more comfortable. We went to Miami many years ago and I remember tracking down the Art Deco and loving it. The Art Deco Festival would be so much fun with the vintage cars and people dressed in period costumes. This summer I took a tour of the Art Deco buildings in Miami Beach. 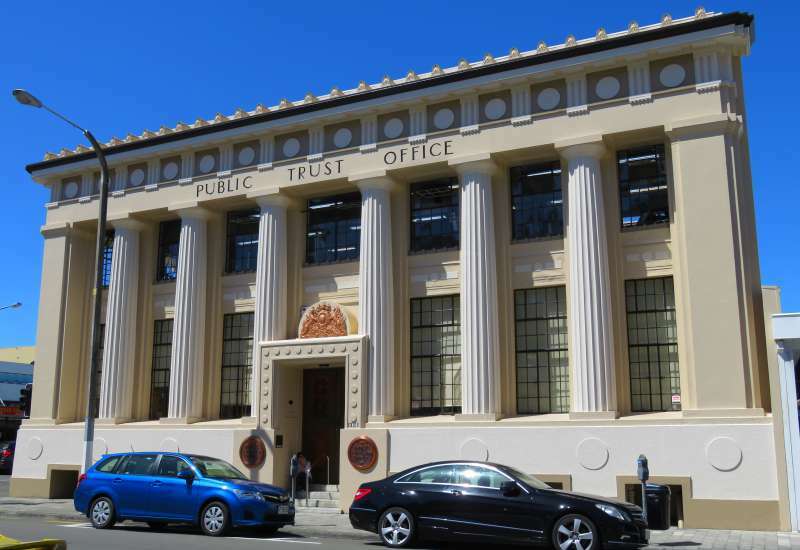 It too has a predominance of Art Deco buildings because of rebuilding after an earthquake around the same time period. 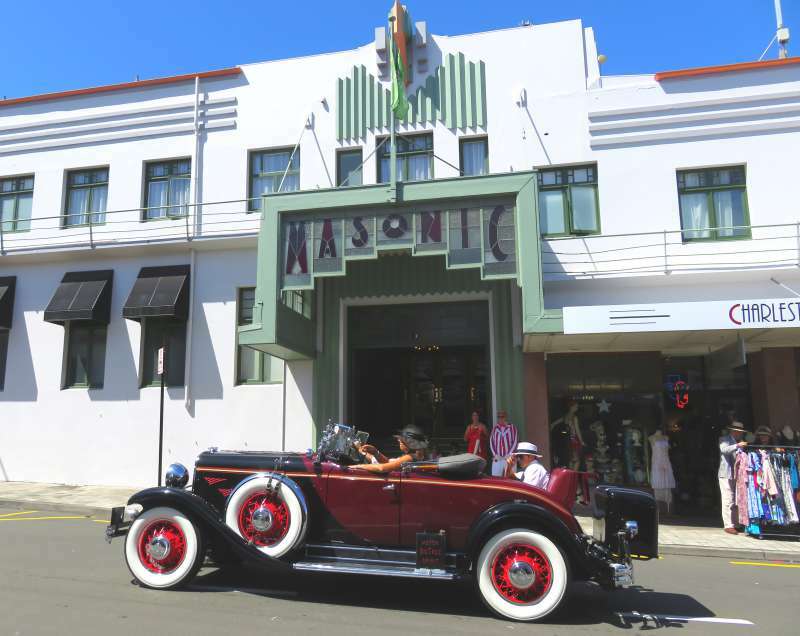 Our tour guide mentioned Napier as another city with a lot of Art Deco buildings. I have been to Miami and seen the Art Deco but I didn't know it came about after an earthquake. David, my other half, is busy planning a trip to Florida for next year so I will probably blog about Miami's Art Deco somewhere down the track. 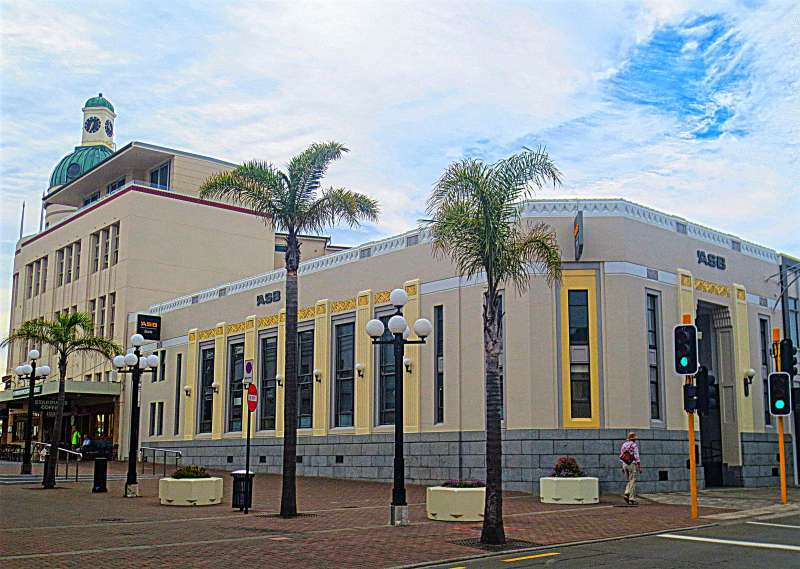 LOVE the art deco look of the buildings in the Napier region. It SO reminds me of South Beach, FLA.
Quite a few people are saying the same thing and I remember thinking it when I first saw Napier. 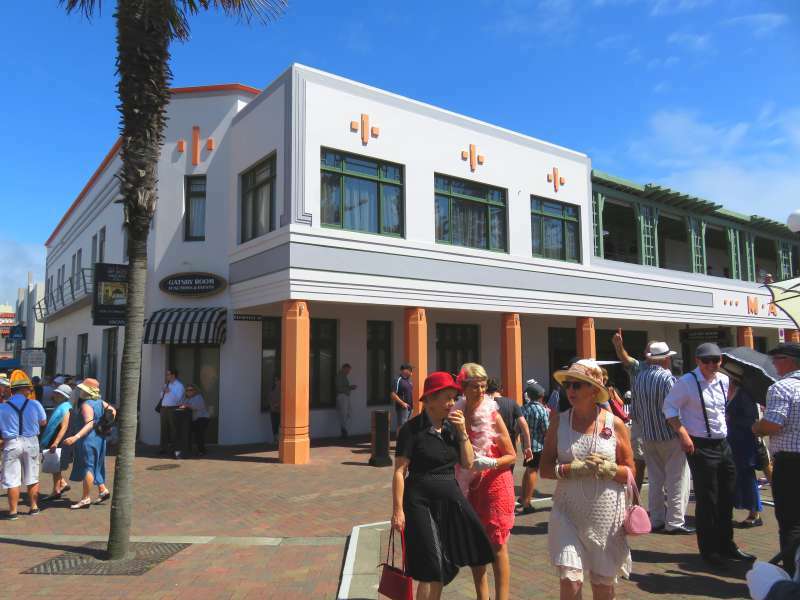 I loved Napier and its Art Deco buildings. 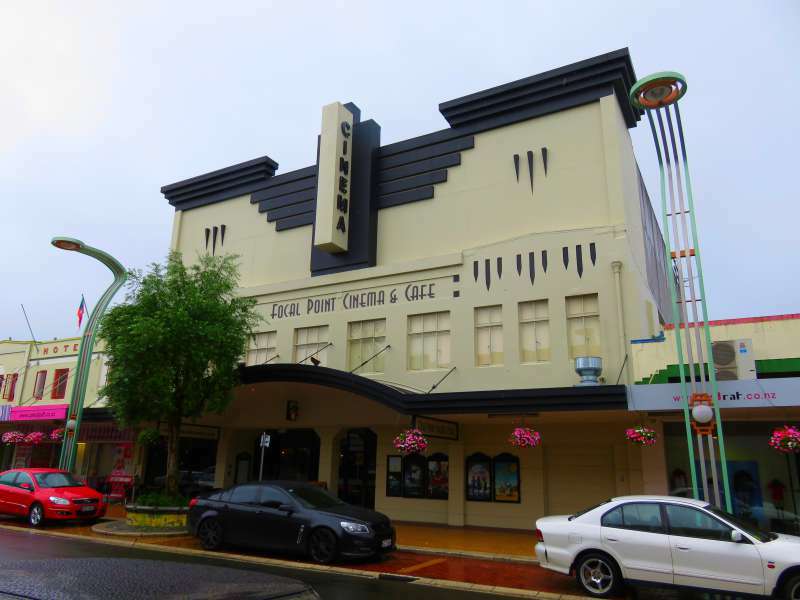 In fact there seem to be quite a few Art Deco buildings in many of New Zealand's towns - it was obviously a boom time for building. You're right. I hadn't thought about it before. My goodness - yes, it looks like stepping back in time with those buildings! And 2.5 minutes is a long time to experience an earthquake...it must have been terrifying for all. We are so fortunate in Australia that earthquakes are a very, very rare phenomenon. There was a serious earthquake in Newcastle a few decades ago but apart from that I can't remember any that were big enough to do any damage. Man, you guys had the best timing for your trip, arriving just in time for the festival! That's pretty incredible how well the 1930s era architecture has been preserved after all this time! Pretty cool to see that classic car and all the 1930s fashion as well! Our timing was pure coincidence but I loved the festival. Loads of people travel around New Zealand by campervan so I am sure you would love it as a destination. I love Art Deco, it is my favourite architecture and one of the reasons Miami is on my wish list. How nice that there is somewhere a little closer to home. We visited Miami so long ago I can't remember whether the Art Deco was as good as Napier's. I remember going especially to see it at Miami Beach but that's about all. We are planning a return trip to Miami next year or the year after and I intend to hunt down the Art Deco again. You should look for the photos around town of the day the earthquake happened. Maybe your grandfather is in one of them. I wonder if the baby knew who saved him/her. I did once make a visit to Napier about 15 years ago as a day trip from a Holland-America cruise. I recall that Masonic building in your first image. It was interesting to read your post. 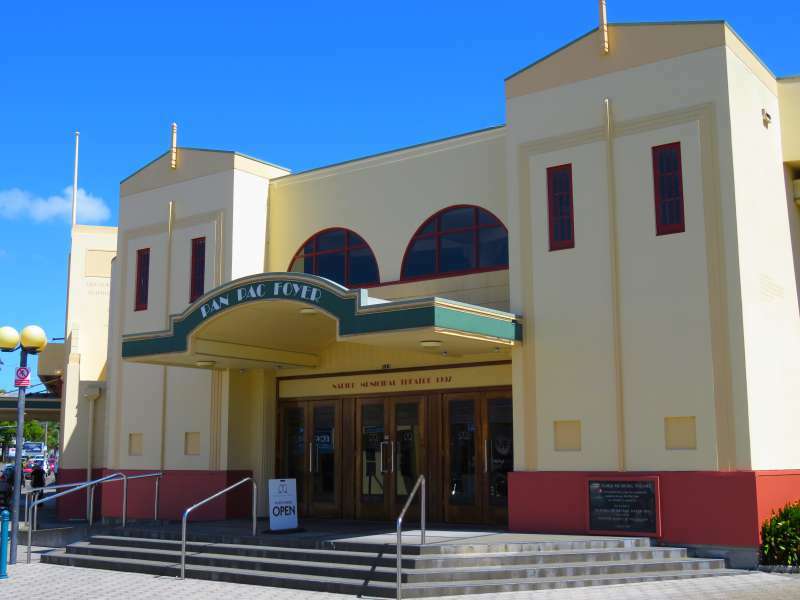 Napier would be a great place to visit on a cruise because the cruise ship terminal is fairly close to the town centre, and it is a very walkable place.